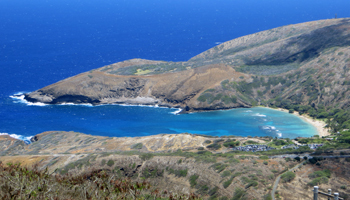 Popular Hawaii Beaches: Hanauma Bay. 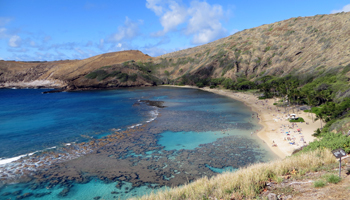 Hanauma Bay: A Favorite Hawaiian Beach for Snorkeling! 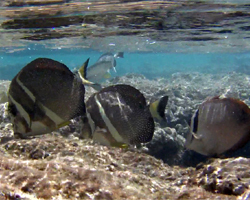 By the way… if you’ll be needing a ride out there from Waikiki and you plan to rent snorkeling gear, you might want to consider consolidating your expenses and getting some extra value in the process with a Go Oahu Card: Shop now and save up to 55% off Oahu's top tours and attractions! Link opens a new window/tab. The parking lot was an unpaved patch of dirt. The beach was rough and rocky. 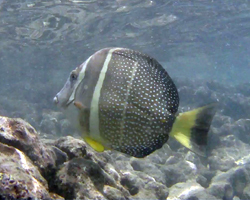 And the water was absolutely packed with sea life! Now there’s a gloriously manicured parking lot (complete with a toll booth and $1 parking fee). 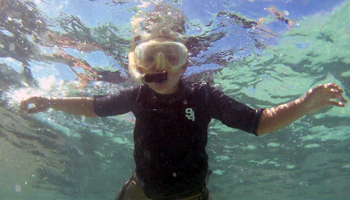 There’s an award-winning marine education center. There’s a snack bar. There’s a gift shop. The beach is covered wall to wall in tons of smooth, white sand (which I assume was brought in to cover the rocks); and it feels like a theme park! Mission accomplished? 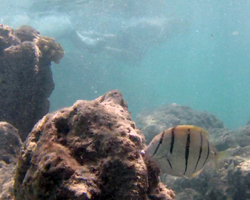 If you’ve never gone snorkeling before, Hanauma Bay could be the adventure of a lifetime. You can bring your own snorkeling gear, or you can rent theirs (sorry, I didn’t think to check the prices because I brought my own gear). I’ve read in a magazine (maybe Scuba Diving) that this beach was named one of the best shore diving locations in the world (and one of the three best on Oahu). 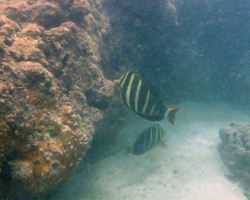 Inside the reef, the water is sheltered and calm most of the time. The sandy beach and seafloor is so luxurious and beautiful that you don’t need any reef-walking shoes. Furthermore, the whole facility is designed for beginners. 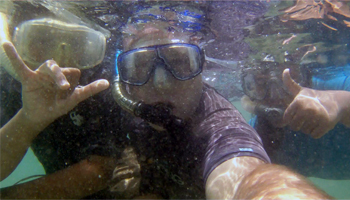 If you have no snorkeling experience, this is an excellent place to learn. Commercial tour activity was significantly restricted and reduced. The nature preserve has expanded its role as an educational resource by hosting field trips for school children, constructing an education center and kiosk on the beach, and by showing an orientation video to all visitors. Waste removal (sewage from bathrooms and trash in cans) has improved dramatically. 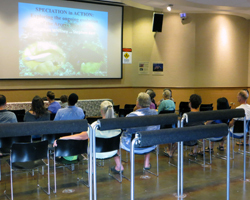 And the facility hosts public educational lectures and presentations. Best of all, it is reported that the ecosystem of the bay has been restored. Beyond that, you’ll just have to look at my pictures. I think I managed to get some fairly beautiful pictures; and they can speak for themselves (because I don’t think I can say any more without sounding snarky). I really wanted to be able to tell you how wonderful it was to go back to the bay after so many years. The “improvements” were visually appealing; and I was so hopeful that the overall thrill of the experience would far outweigh my misgivings. But no. 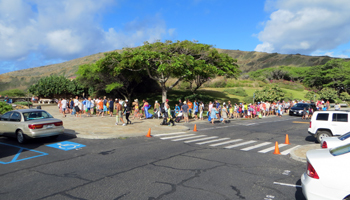 I’ll probably never go back to Hanauma Bay ever again (at least not by my choice); and I would never pay money for this experience. If you used to go to go here back before everything changed, it’s possible you’ll suffer some of the same shock. First of all, I should probably warn you that my negative opinion of the entire experience was perhaps unfairly tainted by the fact that, for the first time in my life, I had to wait in line for an hour and twenty minutes just to get to the beach! I’ve never waited in line to go to the beach, so that just seems excessive to me. We went on a Monday and arrived at 8:20am. Even that early on a workday, we were the second to the last car allowed in before the parking lot closed due to being completely full. The parking lot re-opens throughout the day (at the discretion of the toll booth operator) as people leave and stalls open. One of my favorite Hawaii adventure activities throughout high school and college was goofing around at the “Toilet Bowl” (a natural rock formation around the side of the bay that basically flushes seawater in and out by wave action). I was totally hoping to go there during my trip to Hanauma Bay; and I was further disappointed to discover that it is still closed. So I asked the staff at the visitor center if the Toilet Bowl is permanently closed. The response… “I wouldn’t say permanently. It closed 10 years ago due to falling rocks.” How that answers my question I’ll never know. As best as I can figure it, he meant that it could re-open when there are no more overhead rocks. So come back in one million to a hundred million years, and I’ll tell you all about it! Thirty years ago, this was not a very sandy beach. It was rocky – especially in the water. But now, the beach and the seafloor between reefs are covered with a thick layer of beautiful white sand. Normally, this would be great; but for everybody who wants to snorkel at Hanauma Bay (probably 90 percent of those present) it means they are constantly kicking up clouds of silt. As a result, in some places, the water is so murky that it’s nearly impossible to see for more than a meter or two! Also, you are no longer allowed to feed the fish. I never used to do this; and I agree that this is a good policy change. 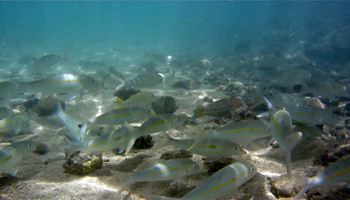 But I also noticed that the (perhaps unintended) result is a decrease in the amount of fish swimming around in the shallows. Thirty years ago, you would have been surrounded on all sides by fish of every size and color. 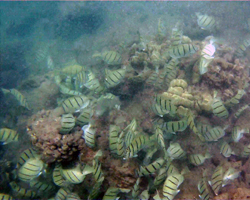 Now, the fish population is no more exceptional than any other reef at any other beach on Oahu. I guess that’s what they mean by balancing the ecosystem. And even though the orientation video shows sea turtles and octopi and other exciting sea life, I’m fairly certain that seeing those is more the exception than the rule these days. Combined with the fact that the visibility is actually worse than it used to be, I can’t say there’s any reason to think of Hanauma Bay as a snorkeler’s paradise. There are places, however, where I can virtually guarantee that you will see green sea turtles. 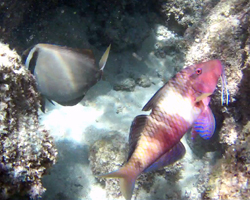 And there are many other excellent snorkeling spots around the island of Oahu. Best of all, I’m not aware of any other beach in Hawaii that has its own gift shop! If you’ve never been somewhere (or some when) better, you’ll probably still find the experience to be amazing. My dissatisfaction stems primarily from an unfavorable comparison to my prior experiences. You may not have any such baggage to lug around. Thus, you could enjoy this nature preserve for what it presently is. 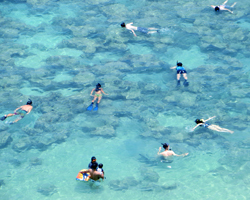 Furthermore, most other beaches don’t rent snorkeling gear, so that could be a major advantage to consider when choosing whether you'll visit Hanauma Bay. 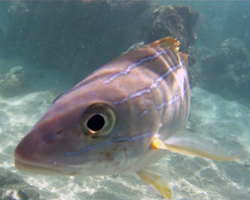 Warning: I swam out beyond the reef hoping to find clearer water. 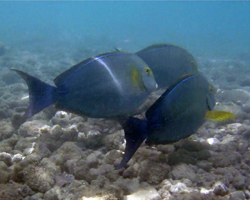 Because it was somewhat choppy that day, the visibility was equally bad, and the current was so strong I could barely swim against it (with swim fins). The current was rapidly pushing me straight out to sea; and for a brief time, I thought I wasn’t going to be able to get back to the beach. Unless you’re a strong and experienced ocean swimmer, I urge you stay inside the reef. Disclaimer: You can’t get hurt here if you decide that it sounds lame and go somewhere else. But seriously… use your brain and take responsibility for your own safety. Know the limits of your ability and stay within them. Watch your kids like a hawk. Heed posted warning signs and lifeguards. Never turn your back to the waves. Use your sunscreen. Don’t feed the fish. Stay off the reef; and have fun. It’s your Hawaii vacation, so enjoy it wisely! 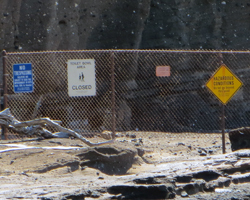 Finally, you are welcome to disagree with me about the current condition of Hanauma Bay. Like I said above… I really wanted to write a glowing review. So if you had a great experience, post it in a comment below. People will love you for it. On the other hand, if you had a worse experience than me, people will probably appreciate it hearing about that too. As for me… I’ll be at Sharks Cove (or any one of a dozen other Hawaii beaches).